Orange-Winged Amazon Parrot Personality, Food & Care – Pet Birds by Lafeber Co.
Orange wings can be spunky and outgoing, but they tend to be mellower and less talkative compared to other Amazons. Like most Amazon parrots, they are social eaters and will appreciate the opportunity to share in healthy meals with their favored people. The orange-winged parrot is also called Loro Guaro, especially in the areas it is native to. The orange-winged Amazon used to be more prevalent in aviculture, and is now fading slightly from the scene due to the popularity of other, flashier Amazons, such as the yellow-naped Amazon. The orange-winged Amazon is considered a “nice little bird,” but it doesn’t prompt the passions that some of the other Amazons often do. However, orange wing fans stand fiercely by this species, and Amazon fans in general will appreciate the lower price and the somewhat yielding personality, though some individuals can be quite temperamental. The orange-winged Amazon parrot can be found in the wild in South America, specifically in Bolivia, Suriname, Colombia, Ecuador, Peru, French Guiana, Venezuela, Guyana, Brazil, Panama, and Paraguay. They travel in groups, along with other Amazon species. Like other parrots in their region, this bird is trapped for both the pet trade and as food. In the wild, many Amazons form social groups that aren’t really “flocks” in the way that we perceive them, with a leader and subservient members, but more like a “commune” living in the same area, helping the others to find food, beware of danger, and offering a variety of members to chose from for mating and nesting. Because this social behavior is ingrained in Amazons, and most parrots are just a few of generations away from their wild cousins, the orange-winged Amazon will thrive only in a social environment where it is allowed to interact with its family members, whether they be other, similar birds, or humans. Amazon parrots have a tendency toward becoming couch potatoes, sitting around a good part of the day, eating starchy foods. But there are consequences for an obese bird: fatty tumors and a greatly reduced life span. Like most Amazon parrots, orange wings are among the longer-lived parrot species; make sure that your children or a good-natured neighbor love the bird too because they just might inherit him. Good nutrition, including lots of fruits, vegetables and nutritionally balanced pelleted diet, and lots of playtime and exercise will keep your Amazon in good shape for years to come. 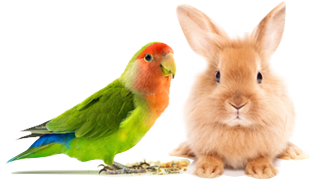 Avi-Cakes, Nutri-Berries, and other Lafeber parrot food also offer healthy nutrition and excellent foraging opportunities. Parrots in general, and Amazons in particular, are long-lived animals if cared for properly. The orange-winged Amazon can likely live upwards of 80 years if given the proper housing, nutrition, exercise, and socialization. Among the feisty Amazons, the orange-winged Amazon is a mellower beast, and makes a good companion for someone not willing to deal with the huge personality of the yellow-naped Amazon parrot. Make no mistake, however, the orange-winged Amazon isn’t a wallflower. It has the lively, energetic, spirited personality common to its family. In general, the Amazon isn’t a bird for everyone, though a handfed orang-winged Amazon parrot, with its amiable personality and striking good looks, can make a great companion for someone willing to put in the time and effort in caring for this underappreciated species. The orange wing isn’t known as the noisiest of Amazons, though noise is in the ear of the listener, and many human companions (and neighbors!) declare that this bird is definitely not quietest of parrots. It isn’t known as the best talker, though some individuals will learn a few words. It is more likely to mimic sounds and whistles. Amazon parrots are prone to becoming obese, which is why owners should pay attention to the amount and types of food offered daily. Other diseases/conditions that affect Amazon parrots include: Polyomavirus (can cause anorexia, lethargy, weight loss, death); Chlamydiosis (signs include low appetite, fluffed feathers, nasal discharge) and vitamin-A deficiency if fed an inadequate diet. As it has happened with other species in the United States, the orange-winged Amazon may become more rare in the pet trade and eventually rise in price in years to come. Prior to 1991, the orange-winged Amazon was available so cheaply and could be found in such large numbers, breeders didn’t set this bird up to breed in the quantities that they did the yellow-naped and the blue-fronted Amazon. The wild-caught orange wing wasn’t hand-raised in the countries of its origin, like many of the other Amazons were, and because of this its pet quality was never appreciated. The orange-winged Amazon hasn’t bounced back from that yet, though more than 1- years later, it’s not completely off the map. The orange-winged Amazon is often confused with the blue-fronted Amazon (Amazona aestiva) because of its size and coloration. The orange wing has a blue “mask,” whereas the blue front has blue reaching from the cere to the eye-ring, where the blue coloration stops. Both species have yellow on the face as well, though the blue front’s yellow coloration doesn’t extend to the cere as it does on the orange wing. Both the orange-winged Amazon and the blue-fronted Amazon are primarily comprised of varying shades of lime and emerald green and both species are found with inconsistent degrees of coloration, with more or less red, yellow, orange, or blue on the face and shoulders. Both are about 14 inches in length, varying by individual, though the orange-winged Amazon parrot is more likely to be slightly smaller. All of this said, these two species are difficult to tell apart for the uninitiated, though one glance at a comparative photo should be enough to tell the difference. Both species are monomorphic, meaning that there’s no visible physical difference between the sexes. The orange-winged Amazon doesn’t have observable orange wings, as the name would suggest, but just the hint of orange on the shoulders, though inspection of the underside of the wing exposes the orange feathers. The blue-fronted Amazon has a dash of red on the shoulders, though it may also have some yellowish coloration there. Both have black and bone-colored beaks, though the beak may be paler on the orange wing.